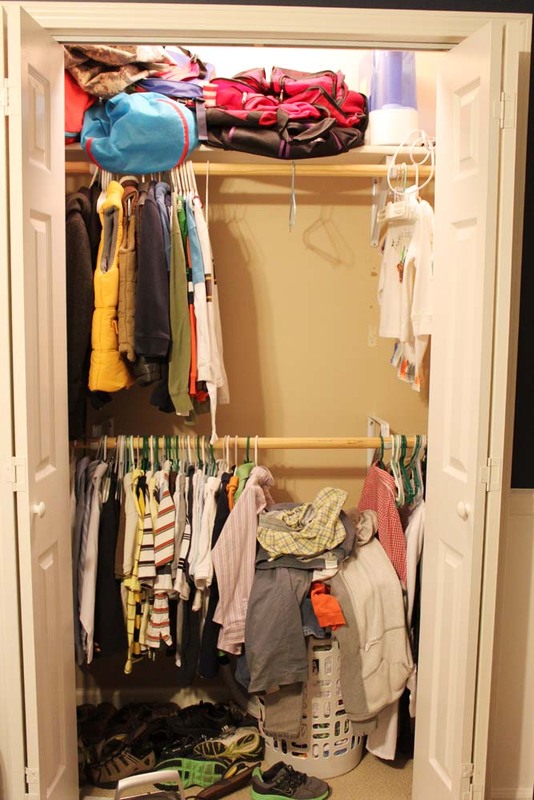 Just before the baby was born last September (and before I had the genius idea of an IKEA hack closet makeover) I was in a panic to get a closet system in his room. (You can read all about that, here.) 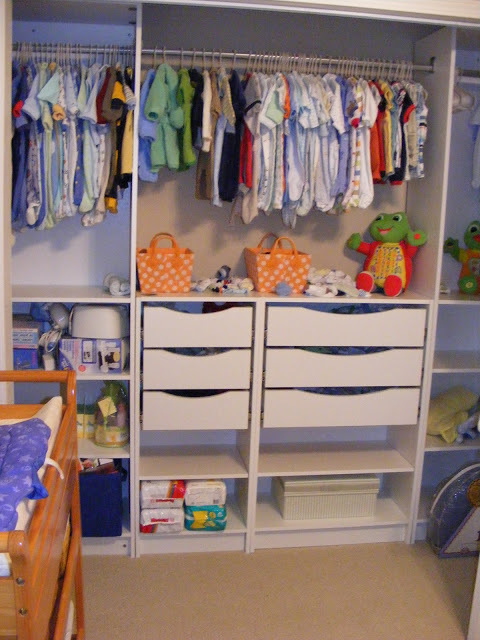 After that, the baby’s closet was the nicest closet in the whole house and sometimes I would go in there, stand in the one room in the house that was organized, and bask in its glory. Wow. That’s actually really embarrassing. Now you know two things: 1) Someone besides the baby needs a closet system and 2) I need to wash clothes. 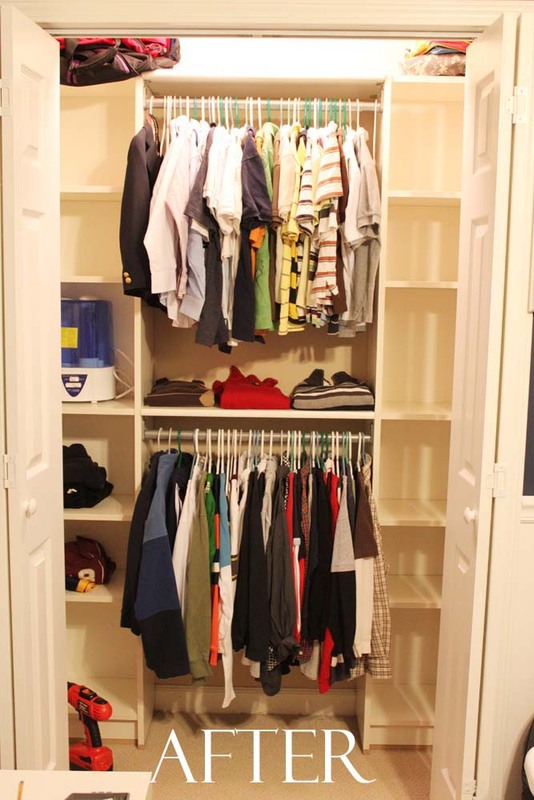 Here’s the thing, the baby’s closet system set us back $700. At the time my desperation, and possibly my hormones, clouded my judgment. But this time there was no way I was spending that much – especially since he has two closets. IKEATall, white and Swedish. 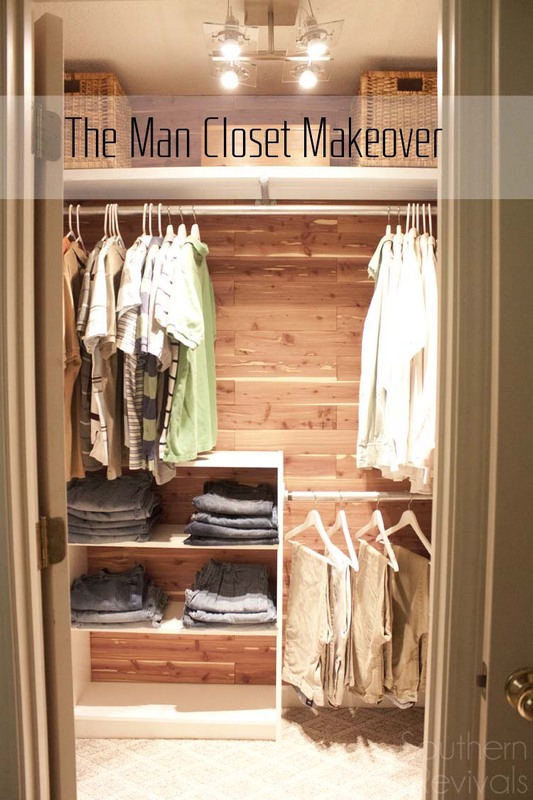 The man of my dreams…in terms of a semi-diy closet system. And he’s cheap, too. We got four of these, two for each closet. 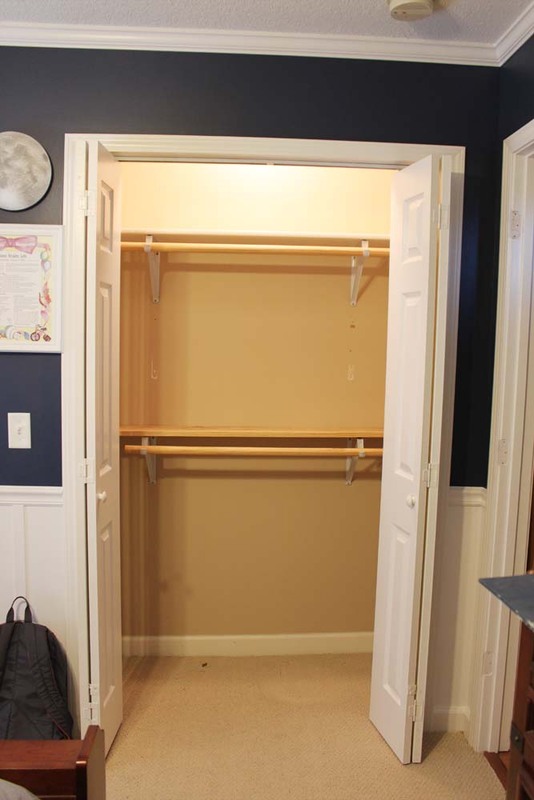 Add some closet rods, some white shelving board and brackets, a small tweak to make Billy a little taller (see below) and you have a closet system for under 100 bucks per closet! 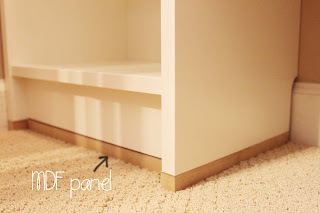 First we added a small mdf panel to the bottoms of each bookshelf to make the notch, already in the back of the bookshelf, fit over our molding. Phew! Much better! Man, I love Billy! Click HERE for the Star Wars themed big boy room these closets for designed for. I just found this on Pinterest. I love the new look (although it is old by now). This is inspiring. Thanks Holly! We still love it, too! I just started this. How did you support the middle shelves. I’m assuming you’re asking about the middles shelves we added? In that case we screwed them in from the opposite side and then covered those holes with the prefab shelves that came with the Billy unit. Hope that helps! LOL Snarky. I like that word! love it! smart girl. off to IKEA after the hurricane passes. Thank you! Have fun & stay safe! To Anonymous, why wasted space? I think it looks pretty good, maybe could use more hanging space, but maybe this suits their needs. I just love those little cubicals. 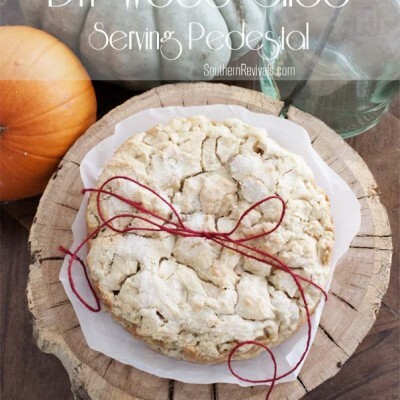 Also saw this on pinterest, looks like it’s making the rounds. 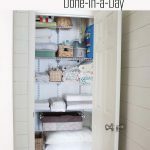 Where did you find the shelving board and brackets that you put over the closet rods? 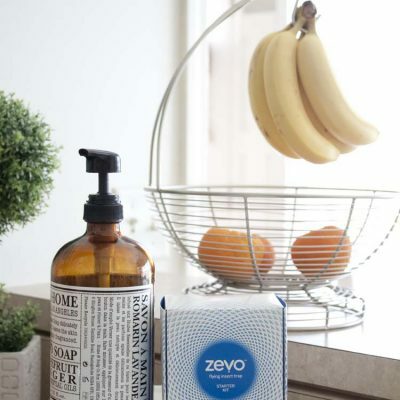 What specifically did you use? Also how did you install the closet rods so that they are secure? Did you have to drill into the bookcase at all? I’m sorry, I don’t remember where we got the closet rods from but they do come in a package with the brackets. I think it may have been Lowe’s. The shelving boards, which were already white, did come from Lowe’s. We installed the closet rods using the brackets that came with the kit. We attached the closet rods to the bookshelves themselves so, yes, we did have to drill into them. 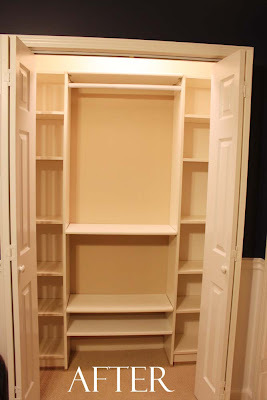 We also attached the bookshelves to the closet walls to keep them secure. Hope this helps! Very nice! Creative and looks much more expensive. Oh so clever! We have a 1960’s ranch and they lived with way less closet space. 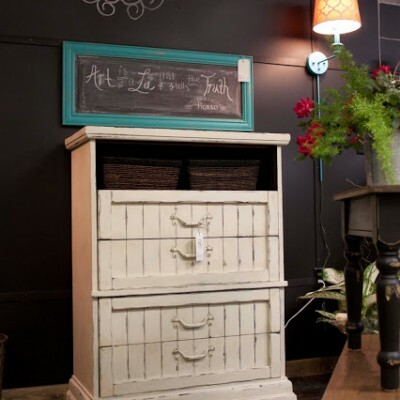 So I am in desperate need for some of this organization. 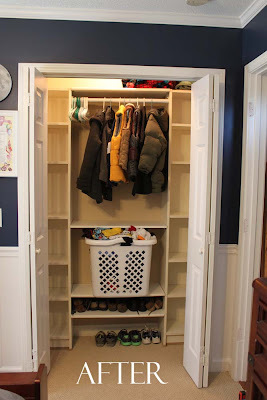 I have never thought of using bookshelves like that for closets. So smart! Rubbermaid, Home Depot, Menard’s, Lowe’s, Ikea ships! If you put too much weight on the clothes bars, will they bend or destroy the MDF or particle board on the shelves? 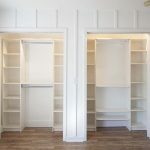 If your child is precocious, will they try to climb up the shelves, either splitting them in half or pulling the entire unit down on top of them and causing serious injury or rip the doors off the closet? 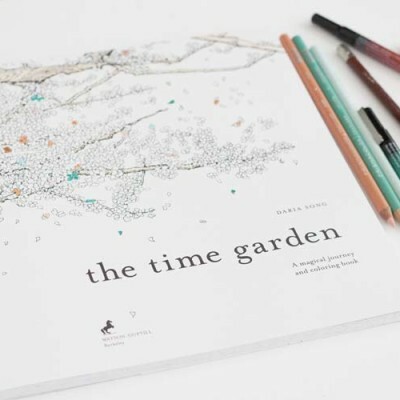 Again, love your design, well done. The Billys measure just over 10″ deep and just over 14″ wide. I think they’d have no trouble growing into that. Good luck! THANK YOU!!!!! 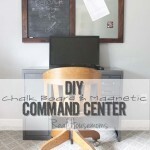 This is just what I need for our very sad and disorganized closets! Creating custom closet cabinets is something my company does and it really does add great value to you home. 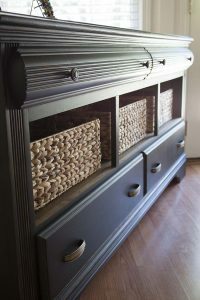 This is a great use of inexpensive pieces from IKEA and making your own if your budget is tight. I love it! And it looks great! 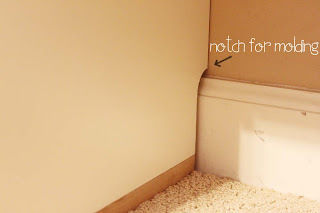 Can you detail how you cut out the notch in the back for the baseboards? We used a jigsaw to notch it out. Hope that helps! Thanks! I’m sorry for lacking imagination, but how did you attach the boards between the shelves (above the rods). I’m squinting my eyes at it trying to figure it out! Not lacking imagination! Let’s call it our amazing ability to hide screws! LOL We screwed the shelves in from the other side of the bookcase. That way once we placed the shelves inside the bookcases our screws were hidden. Make sense? Quick question: In the nursery closet, are the drawer units part of the Billy collection? I can’t find them on their website. Thanks! The baby’s closet is the $1k+ closet system we got from Lowe’s. As far as I know the Billys don’t come with doors or drawers but you could always add them yourself. You’d have to make them though. The Kallax series (replacing the Expedit) has doors and drawer inserts. These are deeper and shorter than the Billys though. Depending on where you’re putting them these could be a better choice. What is the storage unit called on ikea? 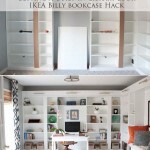 They are the Billy bookcases, half size. 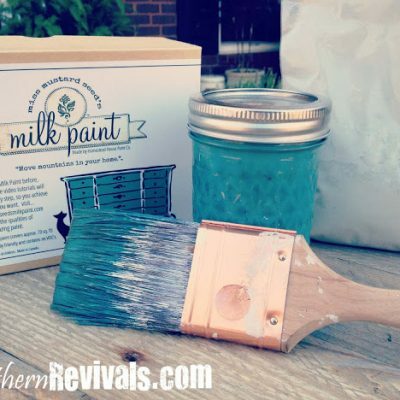 Was so excited to find this post as I am trying to do this for under $100. I see now it is an older post and the Billy is now $69.99. Hard to believe they’ve marked it up $30 in just 3 years. 🙁 If anyone has any ideas on where to get the bookcases cheaper, please let me know. Thanks! I think you’re looking at the Birch veneer. Those are 69.99. The one I used is the white one and it is now 49.99. Just $10 more. 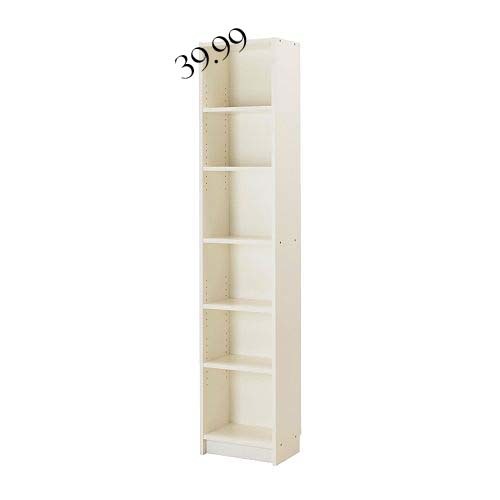 You can find it here: http://www.ikea.com/us/en/catalog/products/50263838/ Still around $100 if you use two per closet. A few bucks more spent on a rod and a couple of shelves. You will still be spending loads less than on a closet system. Hope that helps! We’re planning a similar project and got our Billy’s for free on craigslist It’s unusual to get them for free, but $20 is a common price. Great post!! We’re have the baseboard notch issue in our new house. What is the thickness of your mdf piece and did you cut the front shape yourself? If so, how did you do it? We used 3/4″ MDF and a jigsaw to notch out it. Good luck! 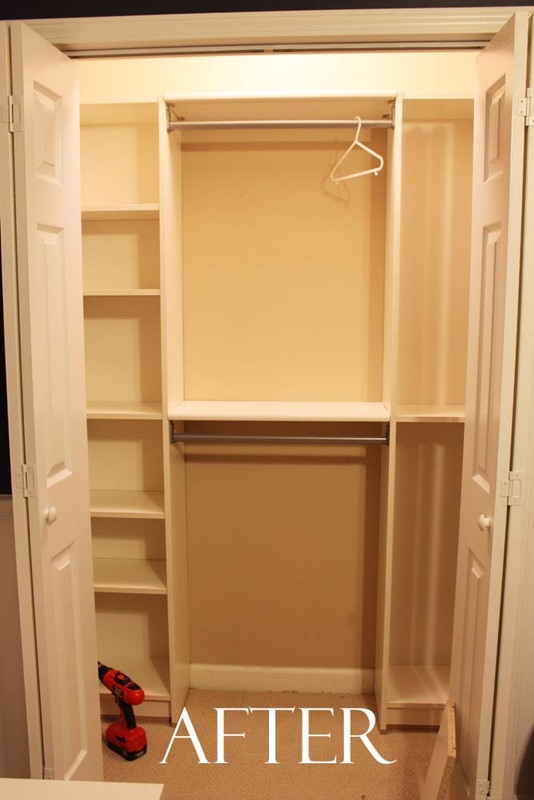 We’re considering a similar look to a large walk-in closet. I’m wondering how well your unit has held up. We’re concerned about the mdf not holding the weight of the rods over time once their loaded. Have you noticed any pulling or bowing or has it pulled out from the Billy unit? Thanks so much! How did you attach the book case on the wall? Is it the one that came with it? The one that you attach on the top of the book case to tha back side wall? Yes! That’s exactly what we used. Then by adding the shelf and bar it completely stabilizes the entire unit.